My TPMS light came on today. As much as I would like to delete that whole mess, I hadn't touched it or done anything to the tires or pressures since I bought the TC several months ago. When I got home and checked the pressures the fronts were at 38psi which is to be expected since I had just driven about 20 miles. The rears were both at 40psi which is kind of strange. First, the rears are supposed to be set at 49psi . Since the light didn't come on till they were at 40 psi either the variance allowed is much larger than we have been told or the actual pressure setting is lower than the 49psi on the door sticker. Second, since both tires dropped evenly they either weren't set at 49psi to start with or we are going to have a problem maitaining the "required" pressure. The idea of a tire dropping 9 psi in just over 3 months/3k miles is a little strange especially since we have not had any extreme temperature changes in that time. I'ts been consistently hot around here the whole time I have owned the TC. I reset the rears to 49psi and took it for a drive. I didn't even get a block before the light went out and stayed out for the 10 miles I drove it. I am going to do some experimenting. If the light doesn't come on till it drops to 40psi then I should be able to run 42-45 psi continuously which would be better than the IMO ridiculously high 49psi on the sticker. I really wish I could get it reset to 36psi the same as the fornt but haven't found a way to do that yet. I wouldn't muck with the rear pressure, as it is 49 for a reason. The TC is tall and will hold 1600 lbs in the back. I'm sure the high pressure is to keep the TC from leaning over much in cornering. You'll also see your mileage go down. I'll never come close to 1600 pounds in the rear and I can always add a little air if I need to. The problem with that high a pressure is that it makes it very susceptible to lift-throttle oversteer as I found out . I can handle it but not sure the wife can. Tire pressure has the least effect on body lean of all the components involved. Spring rate is the primary factor followed by sway bar rate then shock absorber valving with tire pressure bringing up the end. The TC has plenty of spring rate and a monster sway bar under the rear so body lean doesn' seem to be a problem. I didn't notice it in the few laps I got to do on the track at Summit Point. Ok, so you are trying to figure out the TPMS. I oredered my new tires and wheels as a package from TireRack.com. They came with new TPMS sensors installed. I have tried to reset the system by following the proceedure in the manual. NOT! I still have the light coming on. Do you suppose TireRack could have installed the wrong sensors? I am not too savvy on this TPMS sysytem, so if anyone could help me out I would appreciate it. LET ME TRY AND HELP EVERYONE WITH THE RESET OF THE TPMS. I TRIED THE PROCEEDURE IN THE OWNERS MANUAL, BUT IT DID NOT WORK. I SPOKE TO AN EX STUDENT OF MINE WHO WORKS AT THE PARTS COUNTER AT THE LOCAL DEALERSHIP AND HE GAVE ME THE SECRET. I FOUND ON E-BAY A FORD ACTIVATION TOOL PART NUMBER 8CZT-1A203-AA FOR ABOUT $35.00. IT WORKS BUT THE FORD GUYS TOLD ME THAT A MAGNET WORKS JUST AS WELL. THEY RECOMMEND ONE OF THOSE ROUND MAGNETS YOU FIND IN THE BOTTOM OF AN AUTOMATIC TRANSMISSION PAN. FOLLOW THE PROCEEDURE FROM THE SERVICE MANUAL NOT THE OWNERS MANUAL. 1.TURN THE IGNITION SWITCH TO THE OFF POSITION, THEN PRESS AND RELEASE THE BRAKE PEDAL. 2. CYCLE THE IGNITION SWITCH FROM THE OFF POSITION TO THE RUN POSITION 3 TIMES ENDING IN THE RUN POSITION. 4. TURN THE IGNITION WWITCH TO THE OFF POSITION. 5. TURN THE IGNITION SWITCH FROM OFF POSITION TO THE RUN POSITION 3 TIMES, ENDING IN THE RUN POSITION. THE HORN WILL SOUND ONCE ANT THE TPMS INDICATOR WILL FLASH IF THE TRAINING MODE HAS BEEN ENTERED SUCCESSFULLY. 6. IT MAY TAKE UP TO 6 SECONDS TO ACTIVATE A TIRE PRESSURE SENSOR. 7.WITH IN 2 MINUTES OF THE HORN SOUNDING, PLACE THE TPM ACTIVATION TOOL ( OR ROUND MAGNET) ON THE LEFT FRONT TIRE SIDEWALL AT THE VALVE STEM AND PRESS AND RELEASE THE THE TEST BUTTON TO TRAIN THE LF TIRE PRESSURE SENSOR. THE HORN WILL SOUND. STEP 7 FOR THE RF, RR, THE LR IN THAT ORDER, THE HORN WILL SOUND BRIEFLY WITH EACH RESET. TURN THE IGNITION SWITCH TO OFF. IF THERE IS NOT HORN, THE RESET WAS SUCCESSFUL. IF THE HORN BEEPS TWICE WHEN THE SWITCH IS TURNED OFF TRAINING WAS UNSUCCESSFUL AND NEEDS TO BE RE DONE. You are a wealth of knowledge! please keep the good stuff coming! Well, as ususal, the Ford dealer says the part number you gave is not in his data base. Can you either give me the name of the dealer who you bought yours from or steer me in the right direction? THE MODEL NUMBER I GAVE IS FROM THE SERVICE MANUAL. THE TRANSMITTER THAT I HAVE CAME FROM E-BAY AND HAS A NUMBER 8C2Z-1A203-A. IF I REMEMBER IT WAS ABOUT $35 AND WORKED FINE. AS I ALSO NOTED THE PARTS GUY AT FORD THAT I KNOW SAID A GOOD MAGNET WILL WORK AS WELL, BUT I HAVE NOT TRIED IT. MY GUESS IS THAT THE TRANSMITTER IS SOME TYPE OF ELECTRO MAGNET. Anyone just pulled the dash light? I have a TPMS, its called an air guage. BTW, the owners manual instructions worked for me. NCRANCHERO; DID THE METAL SHAVINGS SHOW UP AFTER YOUR ROTATED THE TIRES? DID YOU USE A JACK OR A LIFT? MAYBE IF YOU JACKED UP ONE CORNER OR SIDE AT A TIME IT TWEEKED THE BODY ENOUGH TO SHAKE SOME SHAVIINGS OUT OF THE BODY PANELS OR DASH. I HAVE HAD MINE ON THE LIFT, WITH ALL FOURS UP AT ONCE, BUT I HAVEN'T JACKED IT YET. I can't really say if the shavings were there prior to rotating the tires or not. The oil was changed a week before ago @ the Ford dealership and who knows what they did. Seriously, has anyone just removed the warning light bulb on the dash? I'm asking b/c I remember awhile back people were thinking that the cruise control function was tied to the TPMS, which would be a shame if it actually was. This seems like a whole lotta bother for a feature we don't need. Frankly I like my TPMS. This is a bit interesting as to the functionality of the TPMS. This says the TMPS control module is a "stand alone" receiver. interpret this as you will and it may be worth a try to just unplug the module. NOTE: The Tire Pressure Monitoring System (TPMS) module is also identified as the Vehicle Security Module (VSM). This module contains only TPMS functionality. NOTE: This vehicle requires 2 different air pressures – 1 for the front wheels and 1 for the rear wheels. The tire pressure sensors must be trained following every tire rotation. Failure to train the sensors will result in a false low tire event. The TPMS monitors the air pressure of all 4 road tires via 4 pressure sensors located in the road wheels. 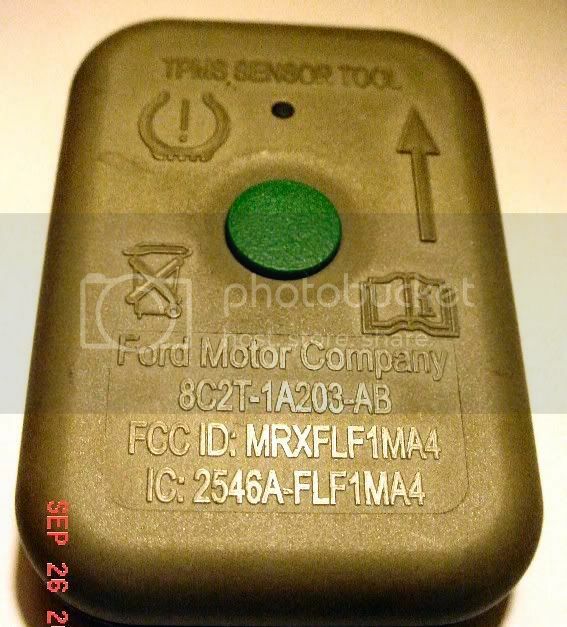 Each sensor has a unique identifier number that is sent to the TPMS receiver during system training. The module retains these identifier numbers in memory and associates them with a vehicle position based on the training order. The sensors transmit pressure information to the module via radio frequency signals once every minute when vehicle speed exceeds 32 km/h (20 mph), or once every 6 hours when stationary. The TPMS/VSM is a standalone receiver located behind the glove compartment. The TPMS function compares tire pressure information against a low-pressure limit. If it determines the tire pressure has fallen below this limit, the TPMS/VSM sends a message to the Instrument Cluster (IC) over the Medium Speed Controller Area Network (MS-CAN) bus. Once the IC receives this message, it will illuminate the TPMS indicator. Cool so it might be possible to just pull the relay (or fuse or whatever) and not have to worry about dash dissassembly to get the light. Nice that it seems to be stand alone. I was finding it very difficult to believe that FORD would tie it to the cruise control. I know people who have Porsches and Audis who have CONSTANT battles with their TPMS. I am just waiting to find the right used one. I just tried Woody's magnet method. The horn didn't sound. Tried a stronger magnet. Pushing the TPMS test button? I take it that is on the reset tool. If not, where is the reset button on the vehicle? Did the owner's manual reset method, aired the tires back up, and it worked fine. All happy now. Sorry. I like the dog with the balloon. Thank you for the reset procedure. I need one more piece of information in order to use the magnet approach; in step 7 you say to "press and release the test button". My magnet doesn't have a test button so, there must be something else to do there. Do you know what that is? My TPMS sensors came on the other day. It was cold and snowing so I figured the tires were low. All 4 were low so I set them at 36 front and 49 rear. Went for a drive, have driven 20+ miles and the light is still on. Is the system monitoring the spare too? If so does anyone know what correct pressure is for the spare? What else could it be? It should be simple, fill the tires with air and the light goes out...right? One thing for any one looking to ignore the warning light, if you need a Safety Inspection from your State, that is considered Safety Equipment and must be working to pass inspection. It is that way here in NH.